by Allan F. Kitchel, Jr.
*NOTE: For the first time ever an audio podcasted reading of this article is featured. In the future expect more of the postings of this blog site to include such digital readings. Enjoy! CLICK HERE FOR THE PODCASTED READING OF THIS ARTICLE. How many times has the wish been expressed, "Wouldn't it be interesting to turn back the clock a hundred years?" The wish is not very far from the thought as one muses over the history of Greenwich and begins to appreciate the beauty that must have been our forebears a century ago when life did not seem to be in such a hurry to get places and when things were done, and done well, in spite of the less rapid acceleration of living. Perhaps it was more than it 100 years ago that a member of the famous Mead line of Richard and Col. Thomas A. Mead wrote a letter to a friend in which the writer expressed such delight at the fields of waiving grain through the valley, along the knolls and riches to the hemlock woods, the apple orchard, and the pastures. It might have been before 1837 and it might have been later. The date does not matter. The writer gazed out the window of the house, now the home of Ralph E. Brush on Grove Lane, and thrilled at what he termed his "dear fields." Today, Dearfields is the name of the homestead, the same homestead that Richard Mead received from his father, Dr. Amos Mead, in 1797. Judge Hubbard wrote that Dr. Mead built the house for his son when the famous character "took himself a Colonial dame." We felt grateful to Dr. Amos Mead when we had visited the homestead and seen some of its beauty and solidarity. "Dearfields" combines that rare essence of the antique with the marvelous spaciousness of interior. Dr. Mead built a house of oak and white clapboard, of decorative rooms and delicate panelling. Time has wrought a few changes. There are additions and slight changes to the interior, but the changing scene can find little else to shed a tear over. That is why it occurred to us to turn back the clock. Not for any reason of trying to grasp lost essentials and lost beauty of the house, but just to be able to be, for a brief moment, with the writer of the letter as he surveyed the waving fields of grain and hemlock woods... "his dear fields." There has been one change, rather important one and one which would mean more than a mere turning back the clock for us to be able to survey the acres of fields from the same spot where that letter writer surveyed them. The house has been moved. A short sentence to relate the story of a change the caused much excitement here in town back in 1929 when Mr. Brush moved the house from the corner of West Putnam Avenue and Dearfield Drive, where Franklin Simon's now does business, to the small lane to the left of Dearfield Drive just before one comes to the traffic circle. The house today faces the same direction that it did before moving – the south. Most of the old houses in Greenwich, strangely enough, do face that direction. The lane passes the north side of the house now, originally the back. Until one passes through the long-hall and out onto the lawn behind, it is hard to realize that the directions have been reversed. The most advantageous viewpoint from which to take in the homestead as a whole is from this very back lawn. Something of the romance that has shrouded the place since its erection years ago still clings to the high, white-clapboarded dwelling, with the small windows, back doors, high-pitched roof, and perfect harmony of small and large wings. The place breathes of strength and the beauty of a former period in our history. In perfect step with the mental pace of house and surroundings marches the romance of those who have lived here and made the house famous. Doctors, farmers, soldiers, leaders in town and state affairs, and lawyers have made it their home. Their presence is felt in the spaciousness and beauty of the house itself. 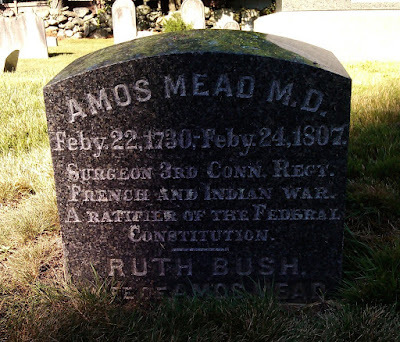 There was Dr. Amos Mead, a surgeon in the Continental army, who, it is said, built the house for his son as a wedding gift. Richard lived in the homestead for the next 29 years, leaving it only when death claimed him in 1826. It was a soldier and the farmer and was on the Committee of Safety in Greenwich. He went to New York with Captain Ibrahim Mead's Company to reinforce general Washington during the bitter fighting around New York. History tells a thrilling story about three patriots in Greenwich during the severe winter of 1779-1780. It was in the month of January and the Sound was frozen over. Cowboys had driven off into the enemy line more than a dozen head of cattle, a prime necessity for the continuation of life in the little settlement here. Richard Mead with two other men, Capt. Andrew Mead and Humphrey Denton, made a daring attempt to cross the enemy lines and return the cattle. Spencer P. Mead tells us that the three men rode out on the ice as far as Mamaroneck, where they returned to land and picked up the trail of the cattle. Blood stains on the snow from the wounds made by bayonets in the hides of the cattle were their guide. They managed to retake the stolen cattle and were coaxing them back to Greenwich when the enemy pursued them and gradually caught up with them due to the weakened condition of their horses. Realizing that sticking together would mean sure capture, they split up. Richard Mead was taken and thrown into the famous Sugar Hole prison in New York City. He was later exchanged. 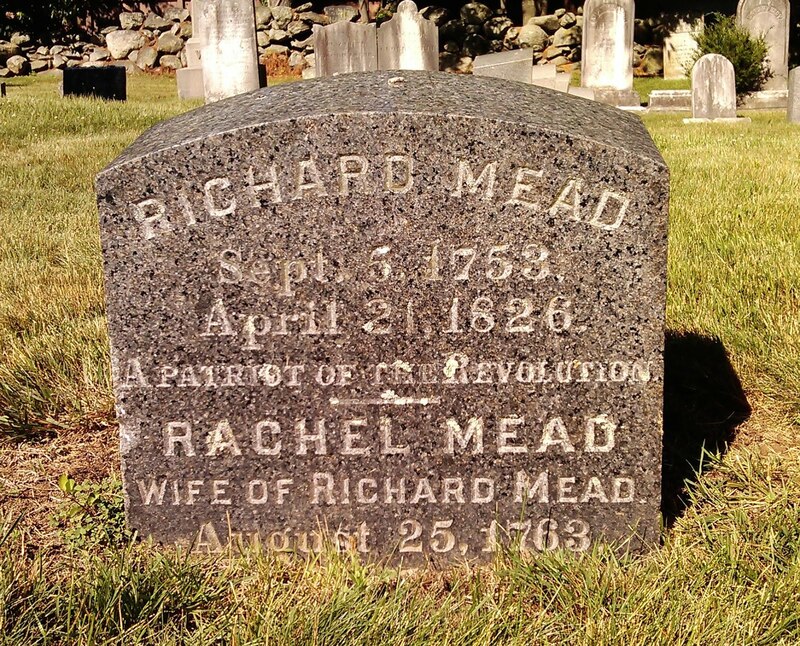 Richard Mead was the great-great grandfather of the present owner. Mr. Brush may well be proud of his ancestors. Colonel Thomas A. Mead, after whom Col. Tom's Hill is named, assumed the role of interested citizen and wealthy farmer in the town. His domain stretched from the Packard Garage on West Putnam Avenue half way to Port Chester, reaching as far west as Edgewood Park and as far east as the intersection of Field Point Road and Brookside Drive. It was presumably he who let his eyes wander with professional and esthetic delight over the fields and woods ...and stream. He was the lord of his domain...of huge barns, waving fields, and prosperous family. Col. Thomas Mead Hill was originally very steep and as far and far from straight. It ran north of the present Post Road where it crosses Horseneck Brook. In place of the present culvert a rickety wooden bridge covers the stream. From this bridge, Colonel Mead could survey the pen where the sheep were cleaned, the swimming hole that Judge Hubbard speaks of in his writings, and the rocks where refugees were supposed to have hid. Thomas A. Mead, as history tells us, was a prominent former, a member of the General Assembly, and active in local and school affairs. In 1824, he was one of the prominent body of local citizens who greeted General Lafayette when he came to Greenwich. The famous Frenchman was the guest of the family during the visit here. In 1826 Thomas was a director of the newly-formed Greenwich Academy. During the two year period, 1831-1833, he was made a lieutenant-colonel. We could go on further, telling how he was a member of the Greenwich Mutual Fire Insurance when it was incorporated in 1855, but hesitate to list the accomplishments of any person. His name brings to mind a picture of civic duty and local pride and a man around whom romance clings. In 1859, the house stood beneath a huge buttonball tree that was visible halfway across the Sound. It was then that Judge Hubbard first remembered seeing the place. He writes that it was a June evening, with the birds making a riot of joyous sound in the trees. He was impressed with the buttonball tree, and with the white picket fence that then protected the house from the road. In that inimitable style that has endeared him to those who have followed his writings, Judge Hubbard goes on to describe the scene over that white picket fence what are young girl, Lucinda Mead, the daughter of Thomas A., presented him with a bouquet of flowers. He was agreeably impressed. And later, the same girl, then grown into beautiful womanhood, was the leader in the social life of the town. The homestead was the scene of many, gay parties… and names such as the "Lancers," the "Schottische," and the "Money Mush" return to delight the mind. "The dances now are quite obsolete," the late historian wrote a few years ago. They may be obsolete but they must bring back to many the thrill of years not so far back in the dimming past. Lucinda of the flowers was sister to Zophar, the fourth in line from the builder. He in turn passed the homestead on to his daughter, Bertha, who married Norman Reynolds and lived in the house until 1927. Judge Hubbard expressed his feelings in a delightful way when he learned that Ralph Brush had purchased the house. He felt that it was fortunate that the doorknobs, "H" and "L" hinges, corner cupboards, and multi-paned windows should become the property of one whose ancestry was so woven in the pattern of the family. 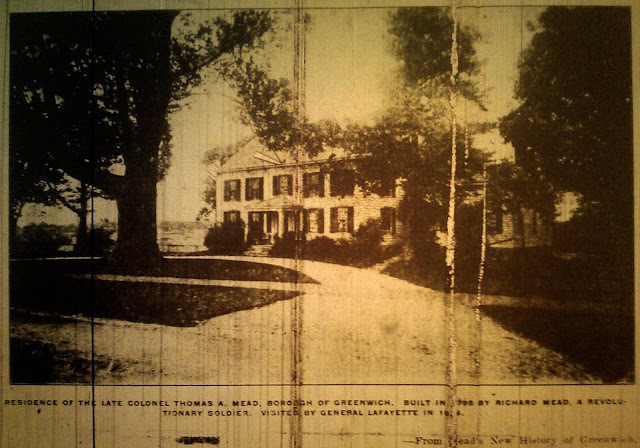 "Fortunate indeed is the owner of such a house with its memories of Civil War days from whence went a favorite son, Thomas R., never to return, and much beloved daughter, Louise, who became the widow of the gallant Major Mead (Daniel M.), our first historian." The point is raised: How is Mr. Brush connected with the builders? He is as we have said before, the great-great-grandson of Richard Mead. When Richard died in 1826, Sarah and Thomas were both living with their father. Sarah married Joseph Brush, and Amos Mead Brush (Ralph Brush's grandfather) was born in the house. It is also interesting to note that another sister of Thomas and Sarah, Sophia by name, married Peter DeMille and so it comes about that Cecil DeMille, one of the movies greatest directors, is a descendent of the family, too. And then came the day of moving...chimneys were taken down, furnishings were harbored in safer places. Townsfolk gathered in silent, curious throngs to witness the upheaval of a house that had not moved for 130 years. In two sections it went, slowly, down the hill and along the road, until at last peace and quiet for once more its own. It was still on part of Richard's old farm, too. A small addition has been built on to make a garage. The position of one of the chimneys has been changed slightly. But for all the change, and there is really very little, the homestead is still very much the same old homestead that Dr. Mead built in 1797. It is a small wonder that people are proud of it. The visitor approaches the house from the north, by means of a semi-circular drive. The accompanying picture shows the southern front, so be not surprised when we say that the garage is on the left of the house. A segment porch and square, white columns is the first to greet the eye, mainly because it serves as a frame for the door... a black paneled thing with a handsome knocker in the middle. 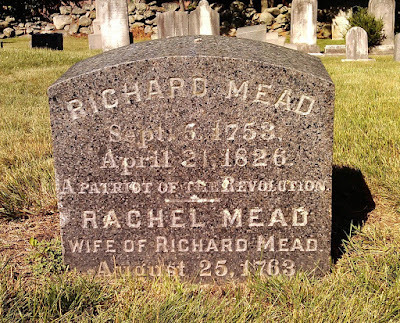 On the marker one reads: "Richard Mead, 1797." Thus assured secured, and momentarily taking note of the twin windows in each side of the door, we step inside. The long hall in front of our eyes defies comparison. In hospitable longevity, its spread out before us. Questions as to its unusual width were answered with, "No it has never been widened." The architect designed a HALL; we had a little further to offer. Before expanding into the rooms of the house with the unique front hallway, we must repeat that the visitor just entered the back door. Ahead, down the long expanse of hall itself, was the front door, it, too, painted black on the outside, opening out on the front lawn and gardens. Leading up the left are the stairs – enclosed, artistically banistered stairs. Directly beyond them is a small door leading to the study, in which one can find a small fireplace, now stained, although Mr. Brush said he took many coats of white paint off before the staining. The walls of the room are of the same color, also panelled. The next stop found us in the living room being amazed at the size of it. Before the secret is told, it must be explained that the living room covers the entire west side of the ground floor to the right as one enters. It is comfortably furnished. Bertha Mead Reynolds wanted a larger room. Originally, the portion of the house was divided into a front and back room. The north room has a special meeting for the present owner for here his grandfather, Amos Mead Brush, was born. He was born in 1823, and his baby cap is preserved in a frame which hangs on the wall of what was then a bedroom. Mrs. Reynolds made one room from the two, taking up the walls on each side of the chimney. When the house was moved and the chimney had to be taken down, another step in the fashioning of the living room took place. The chimney was put back on the end of the house and there you have your living room. Today the fireplace adorns the west wall with beautiful panels and cozy suggestions of warmth. From the living room, another doors leads out into the hall again, across the hall into the dining room. A Franklin stove has been built into the fireplace, a rather remarkable stunt and rather unique. With our guide impatient to show us the view from outside, we took little time to note the charming furniture, but continued into the pantry and thence outside. This might have been a sightseer gazing at the homestead in other days...from a vantage point across the Post Road. Now lawns have taken the place of roads. The house seems to have its best Sunday carb on when one sees it from the lawn. The steep slope of the roof and the whiteness of the two wings appear to their best advantage. The kitchen has not been changed, with the exception of a range, and other culinary accomplishments of the present. The garage has been added on the north side of this corner of the house, with a laundry room tucked away behind the garage. Here can be seen the back stairs, now leading straight up but which originally made use of two points of the compass in gaining the second floor. Slight changes have been made in the arrangement of rooms of the second floor. Most of the changes concern themselves with making the house more livable according to modern standards. Richard Mead's room was at the top of the stairs...across the hall. To the right are other rooms, with a white wall evidence of the change when one small inside room gave way to a closet. Other rooms rested undisturbed over the east side of the house as we opened a door to the north end of the hall and ascended to the attic. For the mechanical youngster who wanted some place to lay his tracks and "play" trains or for the busy mother who goes frantic after the sixth time tripping over said track and trains, the sight of the attic would solve all problems. If aforementioned youngster liked the sight of old oak beams, with ancient mortised joints clearly visible, even the cookies in the kitchen would never induce him to come below. As steep as the roof appears to be outside, it is difficult to describe the height of the attic...or for that matter, the size. All the hand-hewn oak beams are there for one to see...and slowly there comes home the reason for the longevity of such houses is this. Strength and character is written in every beam...such character and strength as the builder and his descendants possessed. The years passed by unnoticed; the winds can blow and rains can fall. The memories of Richard Mead, his son and grandsons will never be disturbed.